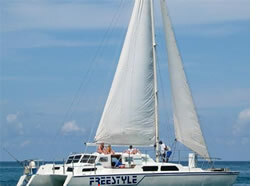 Sail the Clear Blue Waters of the Caribbean an enjoy your sailing experience to the fullest. It will be just the way you want it. Celebrate sailing with lots of music and dancing. Sail along the beautiful coastline of Jamaica. For a quote, let us know the number of people in your group and the duration of the trip you would like. Music along with catering for Bar and Food is available.